This is the last of Faye’s Folkloric Fantasy Fashions (say that ten times fast) and I am pretty pleased. I love the tulip circular border patters and I think every printable paper needs a blouse with checkerboard sleeves and flower design over her cleavage. Actually, this is probably my favorite blouses of all of them, I only make fun of what I really like. The funny bit is that I didn’t really have a super busy week. I got an oil change, vacuumed daily to work on the Flea Removal Project (FRP for short) and got addicted to the show Penny Dreaful on Netflix. Not really the most intense week I’ve ever had. Normally, this is the point where I’d offer some kinda preview like, “Next week there will be…” But as I have no idea what there will be next week, I fear I am going to have to let this one go. Anyway, I would love to hear what you all, my readers, thought of this week’s theme and paper dolls and everything, so leave a comment and tell me what you think of this week. Happy Accessory Thursday! One of my favorite features of this new paper doll blog format is Accessory Thursday. I am finally at the stage where I am designing paper doll sets specifically for this new format and I find I always have to think about what I should post for Thursday. Now, the cape with the hood is maybe my favorite piece from this set of paper doll accessory pieces. I love the pattern and the shape. It is the piece that made me think of Little Red Riding-hood. It’s floral motifs were in part inspired by Jacobean floral embroidery designs. I’ve always loved that style. And of course any paper doll I create is going to have shoes. 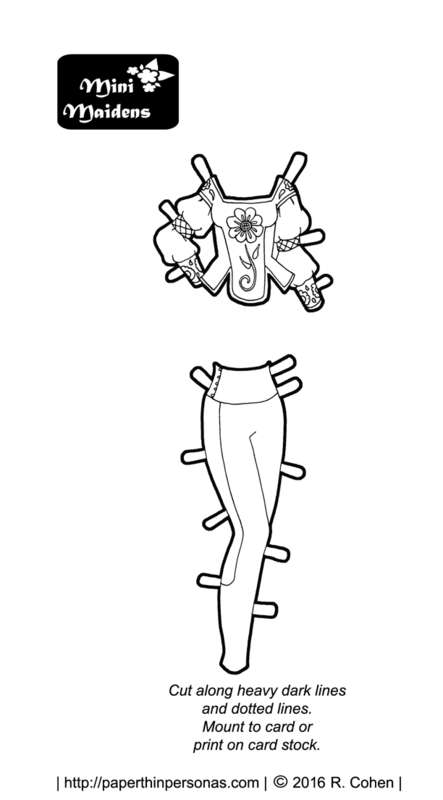 So, Monday’s paper doll is getting two pairs of boots, all designed to go over the leggings she’s gotten. She also has some tulip patterned stockings and slippers. I really had fun making all these tiny patterns up and I wanted to show them off. I actually had a few more pattern motifs that never made it as far as these paper dolls. So, if you missed this week’s paper doll, she’s in Monday’s post. I used Faye, my Asian Mini-Maiden this week. As always, if you like the blog and want to see behind the scenes more (plus get to listen to me complain about fleas) then consider supporting the blog through Patreon. 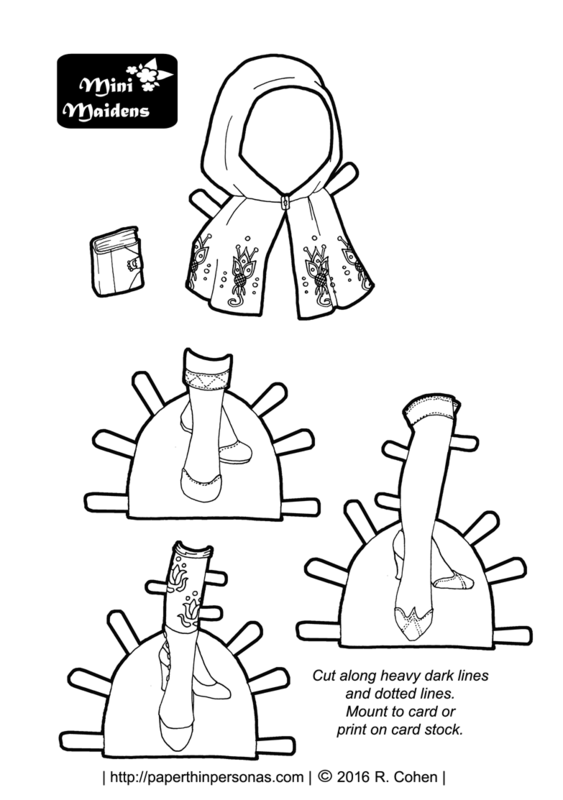 Continuing our folkloric fantasy week, today’s printable paper doll outfit is leggings with another lavishly decorated blouse. I decided to go with leggings, because I feel like fairy tale woodcutter’s daughters need practical clothing to hike through the woods in. 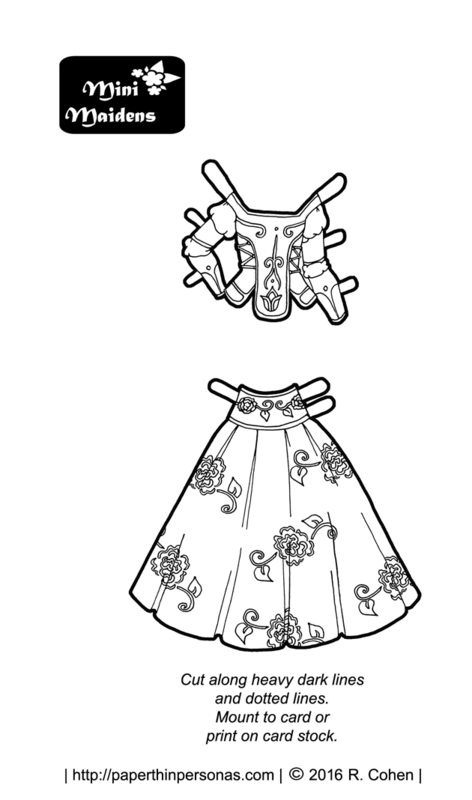 Or at least as practical as anything I design for paper dolls ever gets. Than I would recommend popping over to Monday’s post and picking up Faye there; however, any of the Mini-Maiden dolls can wear these outfits which is kinda fun. I think the Hazel paper doll from Beauty in Bloomers would be really cute in these outfits, plus I love her glasses. Alternatively, Faye paper dolls from Runic Adventures or Meet Faye would be alternatives to Monday’s Faye paper doll. Not to leave Greta or Isadora out of the picture, I think Greta from her Steampunk set would be fun or Isadora’s Medieval Fantasy or when she went to a ball would also work well. A big part of why I create paper dolls who can exchange clothing is because I remember being a kid and having a favorite paper doll from a set and being super annoyed that my favorite paper doll couldn’t wear my favorite outfit. Plus, I tend to think versatility is always best practice. So, thinking in terms of versatility, what would you think would be the best paper doll to wear this outfit? Monday’s doll or is there another Mini-Maiden you would like to see rock some of these outfits. On Monday, I posted Faye and the first of her folk art inspired outfits. Continuing our folk costumes inspired theme for paper dolls this week, today we have a fantasy paper doll outfit featuring a blouse and skirt. The blouse is decorated with a tulip inspired pattern and abstracted tulip decorations on the sleeves. The skirt has a stencil inspired rose motif. Every paper doll needs a skirt covered in roses. Both of these designs remind me a little of rosemaling. Rosemaling is a Norwegian technique of painted curves, spirals and floral designs. Back home in Alaska, there is a town called Petersburg which is very proud of it’s Scandinavian heritage. I remember some of the buildings having rosemaling on them. So, I’m trying out Instagram, but I’m not that good at it. Still, follow me if you want. And there’s always Patreon if you want to help support PTP. The blog is also on twitter @paperpersonas. I am sometimes reminded that my Blog is better at Social Media than I am. So, what do you think of today’s outfit? Would you wear it? I think it’s lovely, but I probably can’t pull off the skirt or the blouse. This week we have Faye dressed up in some fantasy clothes. Some paper dolls are easier to write about than others. Often this has to do with how long ago I drew the paper doll and how much I remember about the original conception. I confess I try to make notes, but I don’t often succeed at that. I seem to remember thinking of Little Red Ridinghood when I designed these garments, but really it could have been any maiden in the woods. It seems to me there’s always in fairy tales, a young woman who lives in the woods and then there’s a woodcutter or something else. Often there’s an evil stepmother eventually who sends the maiden out to find something and we all know how that goes. Or she is kind to an old woman and then gets something like gems every time she speaks. I think a bit part of the pleasure of black and white paper dolls is coloring them in. I wasn’t much into coloring books as a child, but I liked details when I did color. In these costumes, I tried to add details that a person would like to color. Plus, I’ve always loved how lavished embroidered folk costumes looked. So, this is up a little later then intended. I wanted to do a sort of belly dancer fantasy set, and I’m pretty pleased with how it turned out. I think I went through about six color schemes before I settled on this one. It’s not quite what I wanted, but it’s a lot better then the purple and blue version (trust me on that one). When I was a kid, I had a friend whose mother was a belly dancer. I thought that was a most cool exotic thing ever. I’ve never belly danced though- perhaps I will someday. On a semi-unrelated note, The Black Apple is offering this wonderful Winter Girl paper doll download. If you’re not familiar with her art, Emily Martin has also produced on commercial paper doll book called The Paper Doll Primer. I haven’t bought it yet, but its on my list of things to purchase. I love the whimsical, but not cute nature of her paper dolls. I’m a huge fan of whimsey and I’m not a huge fan of overly cute. Today’s Marisole is brought to you by the illustrations of Ivan Bilibin and Russian fairy tales and this random blog post I found of some fairy tale fashions from 2009. Also, the letter F.
I’ve also posted three new pages of clothing for the magnetic Marisole paper dolls. 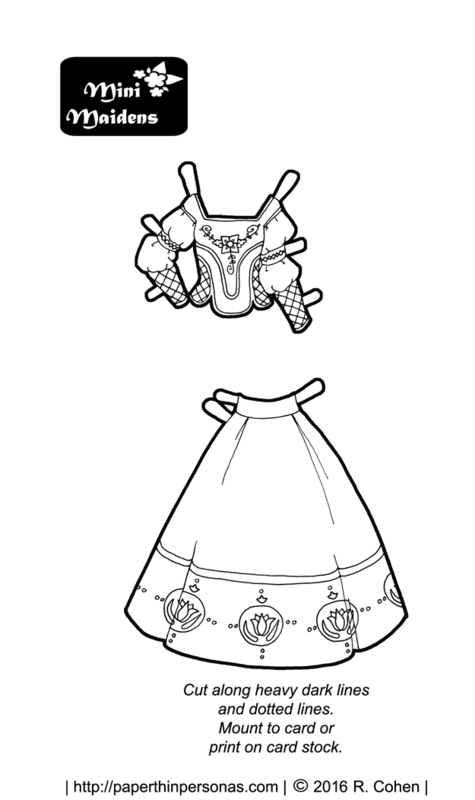 One is a page of fantasy clothing and the other two are historical sets of clothing. I will be posting a new magnetic paper doll set later this week which should be exciting. 🙂 If anyone wants to print out the magnetic paper dolls, this is a great time of the year to find cheap tins all over the place. I’ve seen them at Walgreens and the Dollar Store.